"Dad was a rugged individualist, brilliant, but, well let's face it, a triffle eccentric, living by a code of his own design." Coinciding with the release of the 2003 Steve Martin remake, Fox delivers Walter Lang's (The King and I) original 1950 version to DVD. 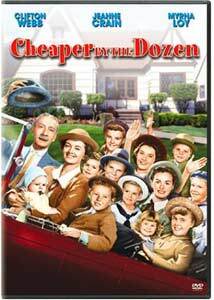 Based on the bestselling children's book of the 1940s by Frank B. Gilbreth Jr. and Ernestine Gilbreth Carey, Cheaper by the Dozen tells the tale of their parents, Frank and Lillian Gilbreth, and their family of twelve children. Frank Bunker Gilbreth was a turn-of-the-century efficiency expert, who pioneered the use of motion picture photography to study humans in motion during various forms of work. His research launched a new era in productivity, by analyzing the work process and looking for ways to make them more efficient. His wife Lillian, also an engineer, was always by his side, and carried on his work after his death. The Gilbreths used the resource of their large family as a model for their studies, enlisting the children to test their many theories and provide practical applications for their solutions, not all of which met with the intended results. The film opens as the family moves from their home in Providence, Rhode Island, to Montclair, New Jersey, and gives an inside look at the workings of this unusual bunch. Life in the Gilbreth household is anything but normal. The majority of the film is a collection of humorous anecdotes as the children live under their father's rules of efficiency. There are a number of strange events that occur, including an assembly line of tonsilectomies, which Frank Sr. tries to capture on camera, and numerous family council meetings that bring up the concerns of the youngsters, many of which run contrary to their father's wishes. Although Frank Sr. is extremely forward-looking in his studies, when it comes to his daughters and current fashion, he was anything but. Clifton Webb does a fine job as Frank Gilbreth, with Myrna Loy providing ample support as his wife, quietly balancing the needs of her husband and children. Jeanne Crain and Barbara Bates handle the roles of eldest daughters Ann and Ernestine well as they attempt to drag Gilbreth into the modern era, and Jimmy Hunt is a hoot as little William, who gets the monumental task of trying to persuade the chair (his father) of the merits of buying a dog. Truer to the original story than its recent remake, for the most part, the film is a whimsical affair, with plenty of laughs as the family interacts with each other. However, it takes an ubrupt about face in the latter half with the death of Frank Sr., and while it manages to recover by the conclusion, it certainly changes the tone dramatically. Enjoyable overall, there were times when the direction seemed a bit stiff, and some segments were a bit overlong for my liking. Suitable for all ages, Cheaper by the Dozen provides a fun family adventure, and a look back at a time when dad was the king of his castle. Image Transfer Review: Image quality is repectable, but does show some signs of its age. The source print is in relatively good condition, with only a few major blemishes, with the rest being the usual assortment of minor dust and scratches. Grain is fairly well rendered, though does exhibit some compression effects in places. Color is for the most part quite good, usually well saturated, but is sometimes a bit unstable and washed out in appearance. Audio Transfer Review: English audio is available in stereo or mono. Aside from the musical cues, the stereo track is pretty much center focused, with the mono track being a little more strident. Both are free of any major distractions. Tonal coverage is adequate and dialogue is easy to understand, and not overly sibilant. While not overly impressive, it serves the film well. A Spanish audio track is also present. Extras Review: Extras include trailers for the 1950 and 2003 versions of Cheaper by the Dozen and the original sequel, Belles on Their Toes. Also included is a brief Movietone Awards presentation made to the film's screenwriter, Lamar Trotti, which is accepted by Ernestine Gilbreth Carey and then-vice president of Twentieth Century Fox. Highly popular in its day, Cheaper by the Dozen takes a decidely humorous look at one of America's pioneering couples and their family, who are much more than a handful. While a bit uneven, this is a fun and sometimes bizarre family picture.